The fourth-seeded Chicago Bulls will open the 2014 NBA Playoffs on Sunday at 6:00 p.m. CT when they host the fifth-seeded Washington Wizards in Game 1 of their first round series. Winners of a season-high seven games in a row and now a season-best 15 games over .500, it’s easy to see why Bulls players are having fun with just three regular season games remaining. In two seasons with the Bulls from 2010-12, Ronnie Brewer developed a reputation as a hardworking, team-first player with strong defensive abilities who added to the roster’s depth. Those are some of the main reasons the Bulls on Monday signed Brewer for the remainder of the season. As March Madness comes to an end, Joakim Noah and Nazr Mohammed will be keeping track of this weekend’s Final Four games with a vested interest. Noah is a former Florida Gator, while Mohammed spent three seasons with the Kentucky Wildcats. 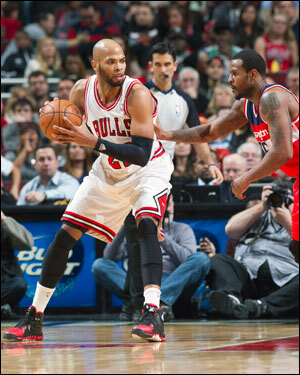 The Chicago Bulls are on the verge of clinching a spot in the 2014 NBA Playoffs. And while that moment could happen in the next day or two, don’t expect a great deal of celebration from the Bulls, who see it as another step in a long process. Tom Thibodeau is a coach who wants his team playing its best as the postseason approaches. That’s certainly been the case with Bulls guard Jimmy Butler, who has averaged 15.1 points, 5.3 rebounds, 2.8 assists and 2.29 steals in 41.9 minutes in his last 14 games. Winners in six of seven games at home and 11 of 14 overall, it’s been an impressive run for the Chicago Bulls as the stretch run approaches.